LinkedIn offers a tremendous opportunity to share your business with prospective partners, clients, and customers. Whether you use LinkedIn to network for your home business or to look for freelance work, your LinkedIn profile is crucial to attracting contacts. Once you've established a LinkedIn login (set up an account) and you understand how LinkedIn works, you'll want to create an effective LinkedIn profile. While LinkedIn makes it easy to fill out your profile, there are a few things to keep in mind as you go through the process. 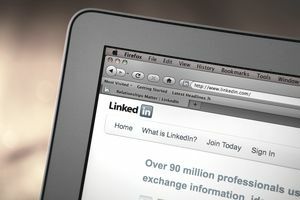 Unlike Facebook and other social media platforms that involve social, daily life and entertainment aspects, as well as business, LinkedIn is exclusively geared toward professionals. Nearly half of LinkedIn members are decision-makers for their companies, so you'll want to make your best impression. Unless LinkedIn members know you already, they're more likely to find you based on a search of skills or industries. Because of this, you need to consider the skills and industry you want to be known in, and determine the best keywords to describe them. For example, if you had a home-based freelance writing service, your keywords and phrases might be "freelance writer" and "copywriter." As you build your LinkedIn profile, you'll use your key phrases in the various sections that describe your skills and experience. Second, many use LinkedIn as an online resume, but resumes are often boring and ineffective in the LinkedIn environment because they're self-focused. Instead, treat your LinkedIn profile like the marketing tool it is, and instead describe your skills and services in terms of benefits your skills can provide to others. A LinkedIn profile has several main components, plus the ability to add more if they're a fit with your skills and experience. Along with adding text content, you can also add links, documents, video, and a presentation to most sections. Title: This part of your profile appears directly under your name. You can write a sentence summary, but often it's more effective to have a list of skills you're known for. For example, mine (Leslie Truex) says, "Work-At-Home Professional, Freelance Writer, Author, Speaker, Entrepreneur." Make sure you use your keywords and phrases to make it easy for potential connections to find you. Summary: Your summary allows you to create a free-form description of your experience, expertise, and your objectives. There are two sections: 1) Professional Experience & Goals, and 2) Specialties. Focus this area not just on how great you are in your home business, but instead on the benefits you offer. For example, don't just say, "I'm a freelance copywriter." Instead say, "I write copy that makes your business stand out from the crowd." Make sure this area is well written using proper grammar and is typo-free. Use short paragraphs with just one or two sentences each. DO use your key phrases wherever appropriate. Try to keep your summary punchy, to-the-point and interesting. List each specialty on a separate line and make it easy for people to see your skills by using a bulleted list. Experience: LinkedIn allows you to create an online resume with your current and previous work experience. Be honest, but don't be afraid to work in your key phrases in this area. Also keep in mind, that if you are currently active in more than one position (I.e. you offer consulting services part-time, but you also work for a bank), the position you list with the most recent start date will appear at the top of your employment list. If you want your consulting business to appear first, the start date you indicate (i.e. February 2009) needs to be later than the start date for your bank job (i.e. January 2009). Use your official job title (if you have one) but include your key phrases when outlining your experiences and successes. Keep your descriptions easy to read, using short sentences and pressing the enter key to insert a line break. Use asterisks or + signs to make a bulleted list. This is another area where you want to focus on the benefits of your experience, not just the experience itself. The goal is to keep your readers engaged so they don't want to leave right away without finding out more about you. Education. Since your LinkedIn profile is an online resume, this area is important if formal education is expected related to your work. Education can be impressive to some, so don't leave this out even if your degree is different from your home business. For example, I have a masters in Social Work, which isn't related to what I do now. Further, this section can help you build connections with former classmates and fellow alumni. Additional Information. Just as it is with a paper resume, consider adding information that highlights your abilities related to your work. You can add your interests, personal information and contact details. Just don't list anything you wouldn't want a potential customer or employer to know about or you wouldn't want to be public information. Keep your LinkedIn profile professional. Don't make the mistake of seeking connections before your profile is complete. At the very least have a professional picture, summary, experience and education completed before reaching out to others to connect. Start your network by connecting with people you know and/or know you. Through them, you can reach out to others. At this point, you can also work on endorsements and recommendations. Skills and Endorsements: You can add your skills to this section during the initial profile set up, but at some point, you'll want endorsements. LinkedIn actually helps you with this by asking your connections to endorse you for skills you have listed. As a way to encourage endorsements, you should endorse others for their skills as well. Recommendations: After you have established a LinkedIn profile and have built up some LinkedIn connections in your network, ask for recommendations from people who are familiar with your professional skills. The right recommendations can help your profile stand out and can lead to landing clients. One of the best ways to get recommendations is to first write a LinkedIn recommendation for someone. During that process, the person you recommend will be asked to write one for you. To see how your LinkedIn profile looks to the public, click the link next to Public Profile on the Edit My Profile page. Creating a LinkedIn profile is an easy undertaking, but it requires planning and nurturing to realize results. Since this online resume is available around the clock to potential connections and even possible employers or clients, you will want to make sure it shines. You'll also want to make sure it's up-to-date. In fact, each time you update your LinkedIn profile, those in your network will be notified. You can view my (Randy Duermyer) LinkedIn profile as an example. If you want to invite me to join your LinkedIn network, indicate that you are a Home Business reader in your invitation so I can give your request the proper attention it deserves.